The Diocese of Cleveland will be welcoming a new bishop, the Most Rev. Nelson J. Perez, on Sept. 5, 2017. There will be two special events at the Cathedral of St. John the Evangelist in downtown Cleveland to mark the arrival of the diocese’s 11th bishop. On Labor Day, Monday, Sept. 4, vespers (evening prayer) will take place at 5:30 p.m. The following day, Tuesday, Sept. 5, Bishop Perez will be installed as the Bishop of Cleveland during Mass beginning at 1:30 p.m. Because of limited seating at the cathedral, both liturgies are by invitation-only and tickets are required. However, there will be several opportunities to view vespers and the installation Mass. Both liturgies will be streamed live online here and on the diocesan website, www.dioceseofcleveland.org, as well as on the Diocese of Cleveland Facebook and You Tube pages. The live stream of the vespers will begin at 5:25pm on Monday, September 4. The live stream of installation Mass will begin at 1:30pm on Tuesday, Sept. 5. Live television coverage of the installation Mass will be offered on the EWTN nationwide cable television network, beginning at 2 p.m. Sept. 5. Spectrum Cable is also planning to carry the Mass on Channel 1314. In addition, the CatholicTV cable network and radio stations WCCR AM 1260, The Rock, and WILB 1060, Living Bread Radio, will broadcast the installation Mass. Also, Cleveland.com and Ohio.com are expected to stream the installation Mass. Local television stations may carry the installation Mass on their websites, as well. Check the stations’ websites for programming details. 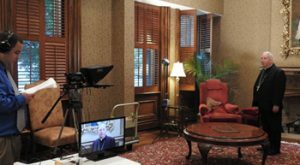 Because of the high interest in viewing the installation liturgies, they will be streamed live on a variety of platforms, including the internet, television and radio. Living Bread Radio — AM 1060 (Canton, Akron, Cleveland) 94.5 FM (Canton Area) and 89.5 FM (Youngstown). The Mass also will be shown on EWTN (Eternal Word Television Network) at 2 p.m. Check your local provider for the channel location. Other TV websites also may broadcast the Mass, so check with your cable or satellite provider for more information. Copyright © 2019 The Installation of Bishop Nelson J Perez. Powered by WordPress. Theme: Spacious by ThemeGrill.